Minister of Finance, Corporate Affairs and Defence Shri Arun Jaitley met H.E. President MOON Jae-in of the Republic of Korea yesterday. Finance Minister Mr. Jaitleycongratulated President Moon on his recent election and conveyed the good wishes of the Prime Minister of India. Complimenting President Moon for his vision for the region and the relationship with India, and recalling the PMs invitation to the President to visit India, FM hoped that the two leaders would meet soon. 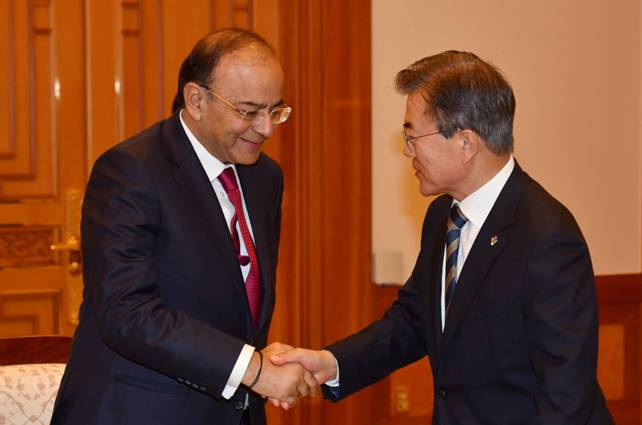 Welcoming Finance Minister Mr. Jaitleyto Korea, President Moon thanked Prime Minister Narendra Modi for his good wishes since the election win, including over Twitter, recalling in particular the PMs gesture of doing so in Korean. Recalling the PMs congratulatory phone call of May 11, President Moon said there was a strong will on both sides in building the bilateral relationship. He also underlined that the decision appoint a Special Envoy to India, for the first time ever by a recently elected Korean President, was a strong sign of Korea’s commitment to the India relationship. (The Special Envoy, former Minister CHUNG Dong-chea, is meeting Prime Minister Narendra Modi, External Affairs Minister Sushma Swaraj, Foreign Secretary Jaishankar and Secretary Preeti Saran on June 16). Conveying the appreciation of Prime Minister Mr. Narendra Modi for this decision, Finance Minister Mr. Jaitley underlined that such initiatives coincided with India’s Act East policy, he emphasized India's conviction that an internationally-minded Korea is good for both Asia and for other nations. 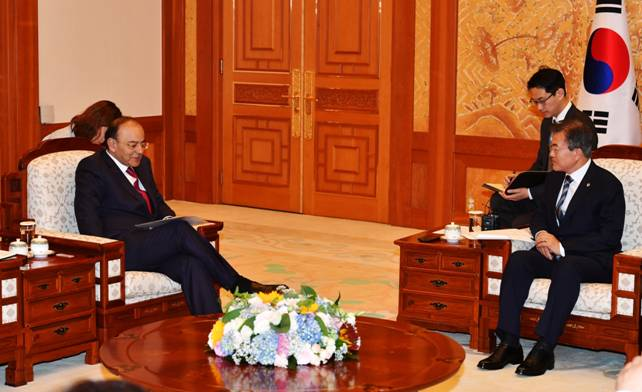 The Finance Minister briefed the President about his fruitful meetings with his Korean counterparts the previous day. He expressed the need for the early convening of the bilateral Joint Commission and the 2+2 Dialogue, to further take the relationship forward. Finance Minister Mr. Jaitley underlined the immense opportunity for the two countries to forge partnerships in defense industry, infrastructure investment and manufacturing. President Moon lauded the bold economic reforms in India under the leadership of Prime Minister, Mr. Narendra Modi and Finance Miiister Mr. Jaitley, and shared his belief that India was on its way to becoming a true economic power. In the process, he hoped that ROK would be a special partner and that the Special Strategic Partnership would continue to grow. He noted the presence of India’s highly skilled professionals in Korea and hoped that such partnerships would continue to help both countries grow. Earlier in the day, Finance Minister Mr. Arun Jaitley had separate meetings with the senior leadership of premier Korean companies including the Vice Chairman of Hyundai-Kia, CEO of Samsung Electronics, Chairman of Hyosung Group, Managing Director of Hanwha Group, Chairman of Doosan Heavy Industries and the CEO of Hyundai Rotem. Minister also separately met, over breakfast, leaders of Korea's financial industry including the CEOs and CIOs of the Korean Investment Corporation, Korea Post, KB Financial Group, Shinhan Group, Woori Bank, Mirae Asset, Nonghyup, and Military Mutual Aid. 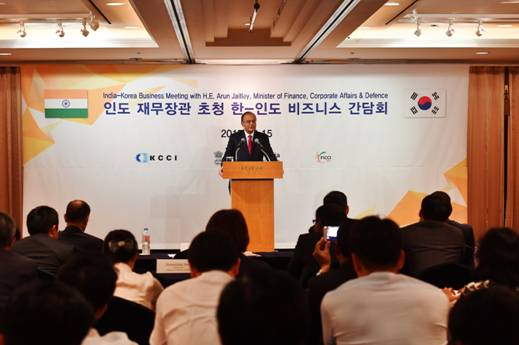 Later in the afternoon, Finance Minister Mr. Arun Jaitley delivered the key note address at an India-Korea Business Meeting at the Lotte Hotel, co-hosted by the Korean Chamber of Commerce & Industry (KCCI), Embassy of India and Federation of Indian Chambers of Commerce (FICCI). Over a hundred representatives of Korean business and industry were in attendance.